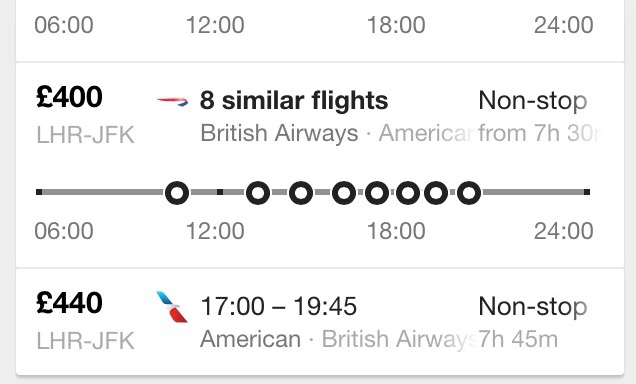 Whenever doing a flight search and you think you have found the perfect flights, there is occasionally a way to book them cheaper.. This means that often, there will be two separate marketed rates for the same flight. Below is an example of a codeshare affiliate, British Airways and American Airlines. They both have rates advertised for the same route on the same date but the rates differ by 10%. A vast amount of international flights operate this way. It is definitely worth checking what else is around. People who are most likely to fall victim to this are those who have a preferred airline and book directly on the airline’s website. For example, in the instance above a passenger is fixed on flying with American Airlines, they could in theory book the identical flight on a British Airways ticket and save £40. Codeshare flight numbers are always 4 digits as opposed to 2 or 3. Sometimes a different airline name will be visible near the flight information. If there is a transit, check the connecting flight as well. So next time you are about to book a flight, do a quick search for the same flight details and if another flight appears similar to the one you are about to book, check if it’s a codeshare. It’s not too good to be true, you can trust it and book it! There are many more codeshare alliances.